Dell has launched a free mobile device management (MDM) app to help IT administrators track and secure the growing number of employee-owned devices being brought into workplaces. The company's free Dell KACE K1000 GO app allows admins to access Dell's KACE K1000 Management Appliance from a smartphone or tablet. They can then carry out a range of tasks that include reviewing and responding to service desk notifications and deploying apps and software updates remotely. 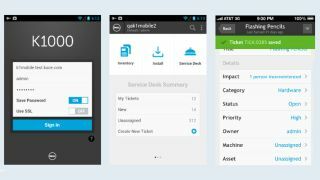 The app, which is available to download from Google's Play store on Android (version 4.0 and later) and Apple's App store on iOS (version 6.0 and later), also provides users with real-time ticket alerts of events through push notifications on both platforms, according to Dell. Aimed at the midmarket and above, Dell's KACE K1000 Management appliance starts at £8,000 and includes one year of support. Jim Docherty, UK Public Sales at Dell KACE, told TRPro that the appliance, along with the new mobile app, can help rapidly growing businesses keep track of devices while simplifying management tasks. He says: "We know of a local education authority running 13,000 devices across 160 sites using a single appliance, which sounds scary, but they're helped by the fact that they can do anything that they might need to remotely." What can Windows 8.1 do for BYOD?